NEW BEDFORD, Mass. — Southcoast Health announced today that the St. Luke’s Auxiliary has made a $118,000 donation to reduce the five-year, $500,000 pledge to upgrade and expand the Stoico/FIRSTFED Maternity Center at St. Luke’s Hospital. Out-going President of the St. Luke’s Hospital Auxiliary, Gary Simmons, presents Jack Dresser, Sr. Vice President of Philanthropy and Volunteer Services, with a check for $180,000 to upgrade and expand the Stoico/FIRSTFED Maternity Center at St. Luke’s Hospital. 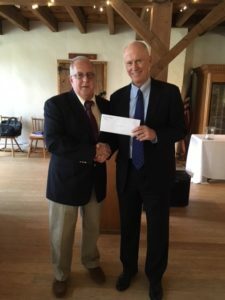 “We are very pleased to help Southcoast Health provide our patients with state of the art care in an environment that truly makes a difference, the Maternity Center,” said out-going Auxiliary President Gary Simmons after presenting Jack Dresser, Senior Vice President of Philanthropy, with the donation at the Auxiliary’s annual meeting on October 10 at Bittersweet Farm in Westport. Simmons also congratulated the Auxiliary members and the St. Luke’s Hospital Gift Shop for raising the funds. After this third payment, the balance of the pledge is $97,220. New officers of the Auxiliary were also voted in at the Annual Meeting including Co-Presidents Joyce Amaral and David Cordeiro, Secretary Helen Stager, Treasurer Carol Forfa and Assistant Treasurer Priscilla McDermott. The St. Luke’s Hospital Auxiliary is a non-profit organization whose purpose is to render service to St. Luke’s Hospital, its tax-exempt subsidiaries, its patients and to assist in promoting the health and welfare of the community. The Auxiliary raises money throughout the year by hosting fundraisers. Joining the Guild is a great way to become involved in your community hospital. Members serve as ambassadors to the community on behalf of the hospital and Southcoast Health. For more information or to join, please call Anne at 508-992-3781.